You are currently browsing the archives for the promotional calendars category. Recently, the Promotional Products Association International (PPAI) released a study conducted in November of 2012. It was conducted at an international airport in New York, and asked random travellers if they had received promotional items within the last 12 months. 70% of them said yes, and were invited to answer a 22-question survey, in which answers were entered into a tablet computer. PPAI had conducted studies in 1991, 1999, and 2004. Those studies, along with two from major US universities, have been quoted numerous times by numerous people in the promotional products industry. However, the current era is one in which the Internet has changed how everyone does business, and there wasn’t a current study. The numbers in the current study were almost identical to numbers in previous studies. Almost every study ever done about promotional products has produced the same conclusions as the others, and has had numbers within traditional margins for error when compared to the others. In other words, virtually every study ever done on promotional products has produced the same results. The recent study was broken into two main parts: recall of promotional products and usage of promotional products. The numbers led to the conclusion that promotional products are as effective as they were 21 years ago, and that they provide the highest amount of ad impressions compared to money spent. Seventy percent of the travellers had a promotional product in their possession. 70% of those said they had at least two in their possession. 88% remembered the name of the company who gave them the gift, compared to 71% who remembered the name of even one company who advertised in a magazine they had read the previous week. Eighty percent said they have multiple promotional products, some as many as ten. Items were kept more often for being useful than any other reason. Pens, computer products, health products, and safety products were the most common categories. Respondents also kept leisure products, travel accessories, and sporting goods, but only if they thought the products were attractive. The products that were used most often, which would make them the most effective at producing advertising impressions, were computer products, electronic accessories, planners, and calendars. Be sure to check www.superiorpromos.com for all your promotional products and promotional items needs. We wish everyone a Happy New Year and look forward to the upcoming year including our ever-expanding line of promotional products at the lowest prices online. We have some big additions coming soon so check back soon for our newest inventory additions. To get started on your first promotional campaign utilizing customized promotional products such as calendars, pencils, pens, coffee mugs, and more, give one of our promotional marketing experts a call at 1-888-577-6667. If you’re looking for promotional products at the lowest price possible, now is the time with the traditional holiday savings that Superior Promos is providing to both new and existing customers. If you’ve ever wanted to witness the impact of promotional products on your business, now is the most affordable time to get a usable product that your target customers can use daily while recognizing and remembering your brand in the process. Our fantastic art department will make your company logo “pop” on all products we carry including 2013 Promotional Calendars, and additional promotional item best-sellers like promotional coffee mugs, promotional pens and promotional trade show tote bags. These are all promotional marketing campaign staples, as various studies have proven their impact (e.g. ASI reports that 81% product recepients keep the promotional item that they deem useful and remember the company in the process while 61% do business with the company behind the useful promotional product). Take a quick look around your house and I’m sure you’ll see a promotional product whether it’s a pad of paper with a realtor’s picture or refrigerator magnet for your favorite pizza delivery place. Read our past posts about proven stats related to promotional product campaign impact but there’s no greater testimony than trying us out and seeing for yourself. Our pricing makes it affordable with minimal investment for such a proven return and impact on your business. Contact us today to speak with our promotional product experts and get the ideal recommendations for your industry. We’ve worked with just about every industry possible and have put together wildly successful campaigns for them all. Are you ready to give promotional products a shot for your business? Now is the time to prepare your company’s 2013’s marketing efforts with a promotional product staple - promotional calendars. If you’ve read this blog for many years, you’ll know how much we love customized promotional calendars and have detailed their effectiveness through various performance metrics including 82% of surveyed men and women can identify the advertiser who provided their promotional calendar. Calendars are a promotional item that stay in plain sight for the entire year on a family or office refrigerator while being a useful item that we don’t necessarily devote time to go out and purchase. The key of any promotional product campaign is to provide exactly that: a useful product that people just don’t have time to go out and buy like they would a new flat-screen TV or Smartphone. To customize your 2013 promotional calendar, place your order today for promotional calendars such as promotional calendar magnets as low as $0.15 per item. Get Ready for 2013 With Promotional Calendars! Promotional calendars are a promo giveaway staple. Now is the perfect time to order your calendars for 2013. Save 10%! 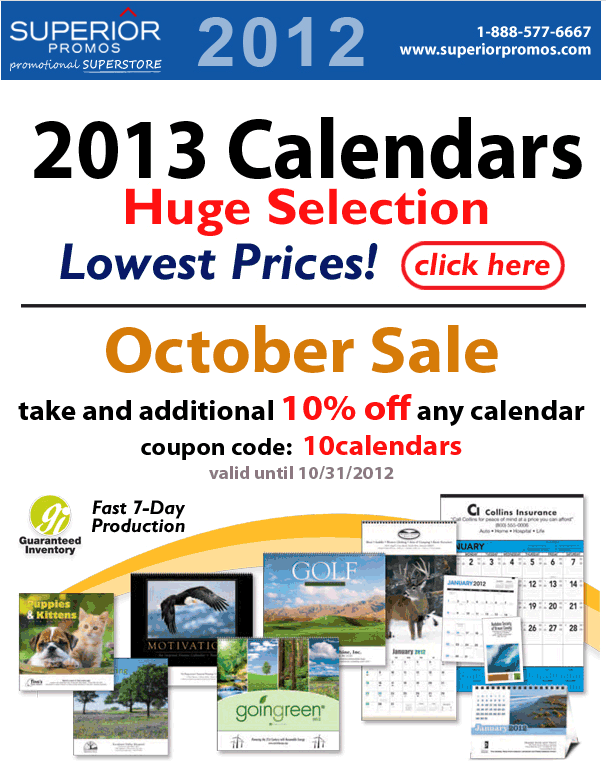 2013 Promotional Calendar Season is Coming… Order Now to Save. It’s almost that time of year again…yes, Calendar Season is coming. Some may underestimate the value a Calendar has in todays technological era, however Promotional Calendars are still relevant and in demand. According to the Promotional Products Association 50% of individuals have never used the Calendar function on their phone and 98% of homes had a printed calendar and nearly every business owned one. With these statistics in mind, has your business picked a date to order your branded Promotional Calendar? According to the recent infographic published by the Advertising Speciality Institute businesses should be targeting them to older females. 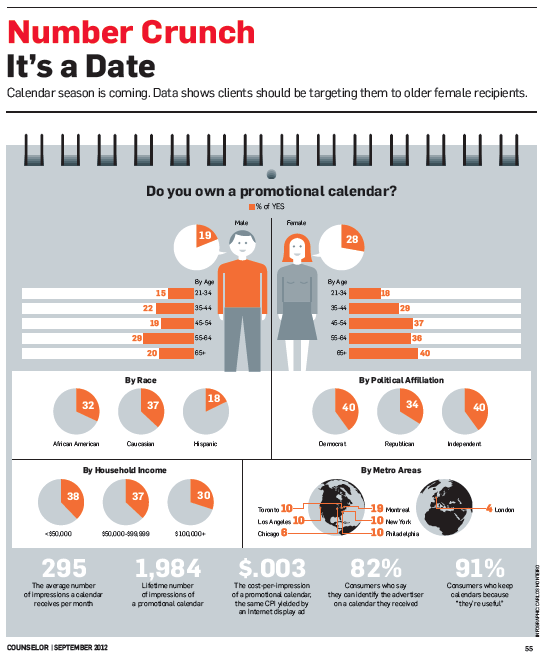 40% of females 65 + own a Promotional Calendar as opposed to a mere 20% of males 65 + who own a Promotional Calendar. The average number of Impressions a Calendar receives per month equates to an impressive 295 with a lifetime numer at 1,984. This boils down to approximately $.003 cost-per-impression while 82% of consumers remember the advertiser of the calendar they received. The Calendar is one powerful Promotional Product! Many of our customers have ordered their 2013 Calendars for the year, we are hoping to assist you with your order before it’s too late! We have a number of different Calendar Options including Wall Calendars, Desk Calendars, Planners, Magnetic Calendars, Pocket Calendars and many more! Time is ticking before 2013 arrives but we are always here to assist you with all of your Promotional Product needs. Do not hesitate to contact us with any questions Call 1-888-577-6667. Don’t forget to order your 2010 Promotional Calendars! With 2009 coming to a close, don’t forget to place your order for 2010 promotional calendars that are customized to your business. View our selection of promotional calendars that can be personalized in a variety of ways. Superior Promos provides you with free artwork services including unlimited revisions so your calendar is done the way you envision. If you need help brainstorming, feel free to contact us for ideas as well.